Western blot analysis of extracts from 293T cells, transfected with 100 nM SignalSilence® Control siRNA (Unconjugated) #6568 (-), SignalSilence® BRCA1 siRNA I (+), or SignalSilence® BRCA1 siRNA II #12642 (+), using BRCA1 Antibody #9010 (upper) or β-Actin (D6A8) Rabbit mAb #8457 (lower). 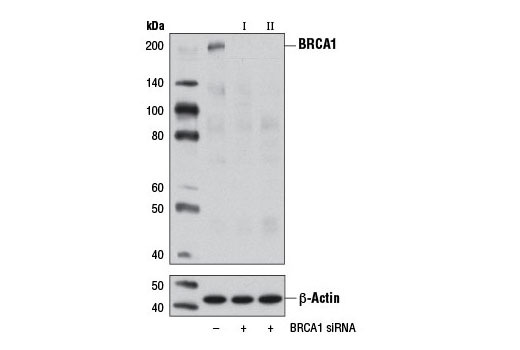 The BRCA1 Antibody confirms silencing of BRCA1 expression, while the β-Actin (D6A8) Rabbit mAb is used as a loading control. CST recommends transfection with 100 nM SignalSilence® BRCA1 siRNA I 48 to 72 hours prior to cell lysis. For transfection procedure, follow protocol provided by the transfection reagent manufacturer. Please feel free to contact CST with any questions on use. SignalSilence® BRCA1 siRNA I from Cell Signaling Technology (CST) allows the researcher to specifically inhibit BRCA1 expression using RNA interference, a method whereby gene expression can be selectively silenced through the delivery of double stranded RNA molecules into the cell. All SignalSilence® siRNA products from CST are rigorously tested in-house and have been shown to reduce target protein expression by western analysis. Oligonucleotide synthesis is monitored base by base through trityl analysis to ensure appropriate coupling efficiency. The oligo is subsequently purified by affinity-solid phase extraction. The annealed RNA duplex is further analyzed by mass spectrometry to verify the exact composition of the duplex. Each lot is compared to the previous lot by mass spectrometry to ensure maximum lot-to-lot consistency. The breast cancer susceptibility proteins BRCA1 and BRCA2 are frequently mutated in cases of hereditary breast and ovarian cancers and have roles in multiple processes related to DNA damage, repair, cell cycle progression, transcription, ubiquitination, and apoptosis (1-4). BRCA2 has been shown to be required for localization of Rad51 to sites of double stranded breaks (DSBs) in DNA, and cells lacking BRCA1 and BRCA2 cannot repair DSBs through the Rad51-dependent process of homologous recombination (HR) (5). Numerous DNA damage-induced phosphorylation sites on BRCA1 have been identified, including Ser988, 1189, 1387, 1423, 1457, 1524, and 1542, and kinases activated in a cell cycle-dependent manner, including Aurora A and CDK2, can also phosphorylate BRCA1 at Ser308 and Ser1497, respectively (6-10). Cell cycle-dependent phosphorylation of BRCA2 at Ser3291 by CDKs has been proposed as a mechanism to switch off HR as cells progress beyond S-phase by blocking the carboxy terminal Rad51 binding site (11). Rahman, N. and Stratton, M.R. (1998) Annu Rev Genet 32, 95-121. Gayther, S.A. et al. (1999) Am J Hum Genet 65, 1021-9. Kerr, P. and Ashworth, A. (2001) Curr Biol 11, R668-76. Scully, R. and Livingston, D.M. (2000) Nature 408, 429-32. Tutt, A. and Ashworth, A. (2002) Trends Mol Med 8, 571-6. Okada, S. and Ouchi, T. (2003) J Biol Chem 278, 2015-20. Cortez, D. et al. (1999) Science 286, 1162-6. Xu, B. et al. (2002) Cancer Res 62, 4588-91. Ouchi, M. et al. (2004) J Biol Chem 279, 19643-8. Ruffner, H. et al. (1999) Mol Cell Biol 19, 4843-54. Esashi, F. et al. (2005) Nature 434, 598-604.